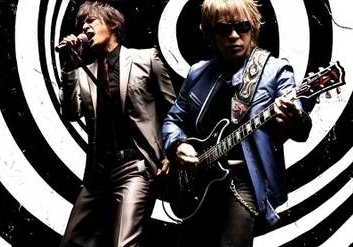 As many of you know, B'z has been touring America for the past few weeks to promote their self-titled debut English album. We were given the opportunity to ask a few questions about the tour, their album, and their process. GK: After nearly 25 years of activity as artists, what keeps bringing you back to music? What keeps the songwriting process fresh? Tak: We just keep creating and doing what we do best. Being a member of B'z motivates me to work hard and keep on going. Koshi: It’s pure pleasure for me to put on a show and have people come to see it. Looking back on our 24 years, I think that we’ve been rendering ourselves in each era in the best way. And we’re still trying new things like this English album. GK: You first performed in America in 2002. Many Japanese artists are surprised to find that they have an American fanbase; was this the case for you? Tak: I'm just so grateful to American audiences are giving us a reason to perform here. Koshi: It was a great pleasure to know there are people who enjoy our music even in places we have never been. GK: What prompted you to do an English-language release? Tak: I always love to play in the US, and I felt we should release English songs for the American audiences. We started the recording last February with Shane Gaalaas, the drummer for B’z. He's a great drummer and a very talented musician. I've never let anyone else produce B’z, but I trusted him to do great work with the English songs. He knows B’z music well. GK: What was the song selection process like when deciding which songs to re-record for your American E.P.? Koshi: Our Drummer Shane helped me a lot. We discussed which songs would work best with English lyrics. We picked 5 songs from our catalog, added English lyrics and new arrangements and re-recorded them. GK: In Japan you’re accustomed to performing in huge venues like Tokyo Dome; however, in America you perform in significantly smaller venues. What is your favorite part about the “live house” feel of your American lives? Tak: I really like playing smaller venues because no big production is involved. I can focus on playing music with just a guitar and an amplifier. Koshi: The audience is very close so I can hear their voices and see their facial expressions. It makes me very excited. GK: Which song are you most excited to play in America? Koshi: All of our new English songs! I’m looking forward to the US audience hearing them. GK: Do you have any words of wisdom to musicians who are just starting out? If you could go back to your debut and give yourself any advice, what would it be? Tak: Listen to all kinds of music. Play with all kinds of musicians. Koshi: Practice a lot and play in front of as many people as you can.